Firstly we here would like to say a big thank you to all of the people who submitted their pictures for inclusion, there are certainly some very talented people out there. So far, only 4 people have seen all of the images, them being myself, Dave, Andre Tempest and of course our judge Squadron Leader Bob Tuxford (Rtd). Out of these 4 only myself & Dave knew who had submitted which pictures. Whilst i’m at it, we here at #twitterVforce would like to say a big ‘CHEERS’ to both Bob Tuxford for kindly agreeing to be our judge (seeing all of the entries it could not have been an easy decision) and of course Andre Tempest for starting this whole ‘Mugshot’ idea off (and keeping Lindy in ‘Better than when in service’ condition). All of the entries will be made into a You Tube video in the very near future, so you will all be able to see for yourself the very high standard. Many congratulations Siobhan, and very soon you will see your image in its final form. 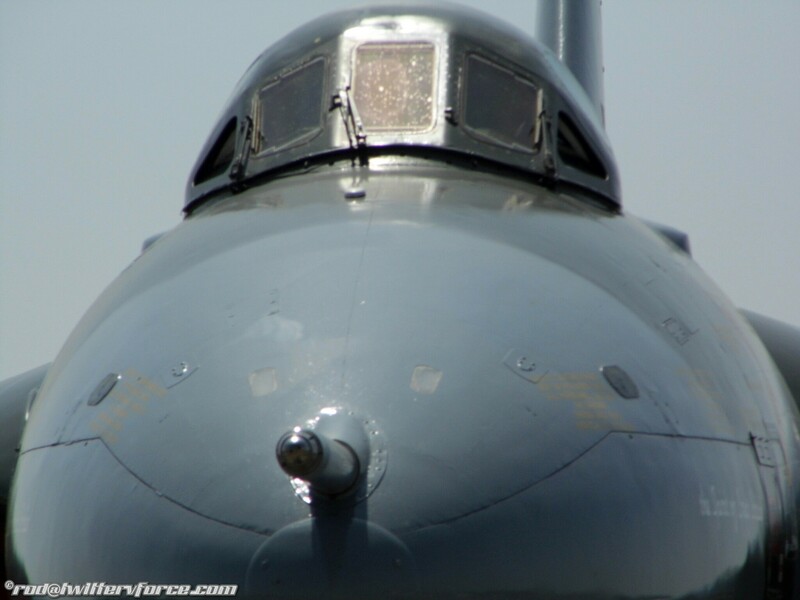 Here is the winning picture folks………..
We are very pleased to announce that the judge for the #twitterVforce/Lusty Lindy OPERATION MUGSHOT competition will be, as previously mentioned, a V Force Veteran. 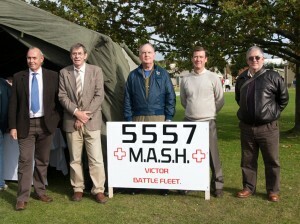 However, not just a V Force Veteran but also a Veteran of the Black Buck Missions during the Falklands Conflict in 1982. Bob flew in many of the now famed Black Buck missions during the Falklands War and was awarded the Air Force Cross for his actions as Captain of Handley Page Victor K2 XL189 during the infamous Black Buck 1 bombing mission. 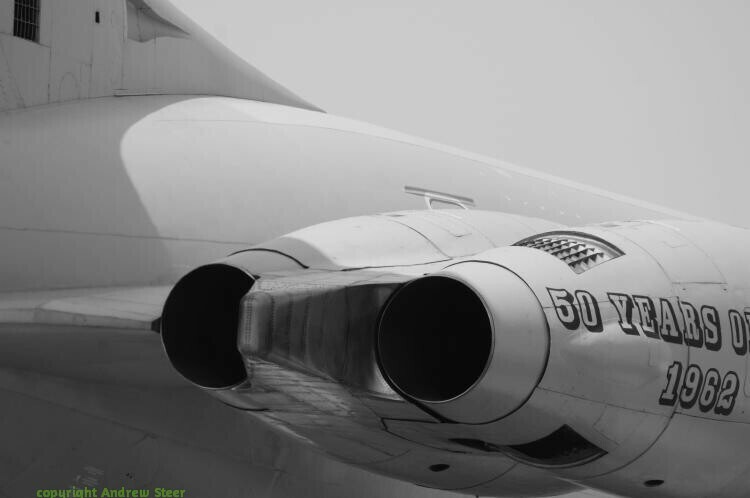 The wait is finally over, the latest #twitterVforce competition is upon us. Reading back along the string, it started to transpire that Andre Tempest (Owner of Victor XL231 aka Lusty Lindy) is after a new design for his mugs that he sells to raise funds for Lindy, and along with a few other tweeters had come to the conclusion that we could help out. Lots of electronic wizardry starts to fly all over the place and we have a plan. The next quandary was how we were going to judge the images. A few ideas had been put into the melting pot but then Andre stepped in with an idea and passed it over to us to see whether we would ‘possibly’ consider it. We wont let on just yet who will be judging but lets just say that it will be a V Force Veteran! What we need are your photographs of Handley Page Victor XL231 Lusty Lindy, whether recent, when she 1st arrived at Elvington or even during her service years. Simple. Now comes the part one of the competition……. You will need to be your own judge as you can only send in 2 images, so prepare to be harsh on yourself. 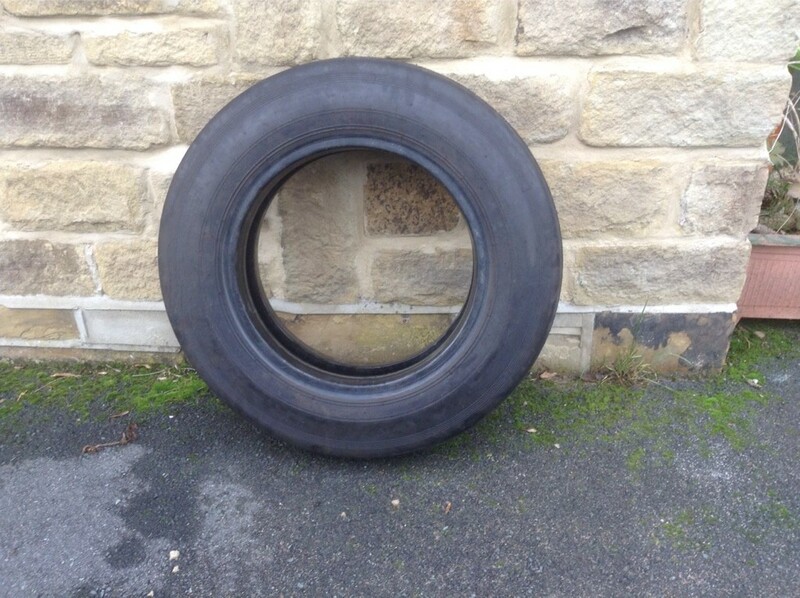 Part 2 of the competition now starts……. 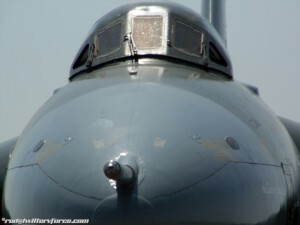 When you have selected your 2 images you need to send them to us via our ‘Mug Shot’ competition submission page at: mugshot.twittervforce.com You will have the option to upload your two chosen best images, plus a few personal details so we can get in touch if you win! Closing date for image submission will be FRIDAY 18th APRIL 2014 so this gives you loads of time to select your best pictures, it will also give those people who do not have any the chance to get up to Elvington and take some. The winning image will be used for the NEW design for the XL231 Lusty Lindy mug & as the winner, you will be invited up to Elvington to meet Andre, Team Victor & Lindy for a full tour and to receive your prize, that being your very own Victor XL231 mug (and to claim your bragging rights). All images submitted (unless requested by the owner), may be published on the #twitterVforce/XL231blogspot and may be created into a You Tube video & used on other platforms. By submitting your images you confirm that you are the copyright owner and that you grant unconditional permission for the images to be published for merchandise & promotional purposes, free from royalties. If you’re passing junction 12 on the M40, you’ll see signs for the Heritage Motor Centre at Gaydon. You’re also driving past what remains of Britain’s first ever operational V-bomber base, which grew out of a Second World War airfield, and now houses one of Jaguar Land Rover’s engineering centres. Last year, I spent a day at the Heritage Motor Centre, learning about the history of the site. As I used to work at Gaydon, and I’m researching ex Cold War airfields for the novel I’m writing, I couldn’t miss out. RAF Gaydon, close to the Warwickshire village from which it takes its name, became operational in June 1942: it had three runways (in an A configuration), with 3 temporary hangars and a total of 27 “frying pan” hard standings. It was a Bomber Command training base, a satellite airfield of nearby Wellesbourne Mountford (Wellesbourne still has an airfield today, and now houses the most powerful surviving Vulcan in ground running condition, XM655). It trained mostly Royal Canadian Air Force crews to fly Vickers Wellingtons as part of 91 Group’s 22 Operational Training Unit. As it was a training base, student crews didn’t fly full-on bombing sorties, but towards the end of their training, they were often sent on leafleting missions over France and the Netherlands. Inevitably, there were accidents: November 1942 saw most of them. On the 8th, Wellington DF742 crashed near the village of Harbury, approximately 5 miles away, after an engine failure: two of the crew were killed. The next night, Wellington HF648 crashed due to engine failure just after take-off, killing all on board. This was followed at the end of the month by Wellington HF633, which crashed with no survivors after hitting trees while circling the aerodrome. As the war drew to a close, flying training at Gaydon stopped in July 1945. It briefly became part of No 3 Glider Training School, but as of August 1946, it was put onto Care & Maintenance. When it became clear that a new kind of threat was emerging to the post-war world, the government developed the operational requirements that led to the three V-bombers. 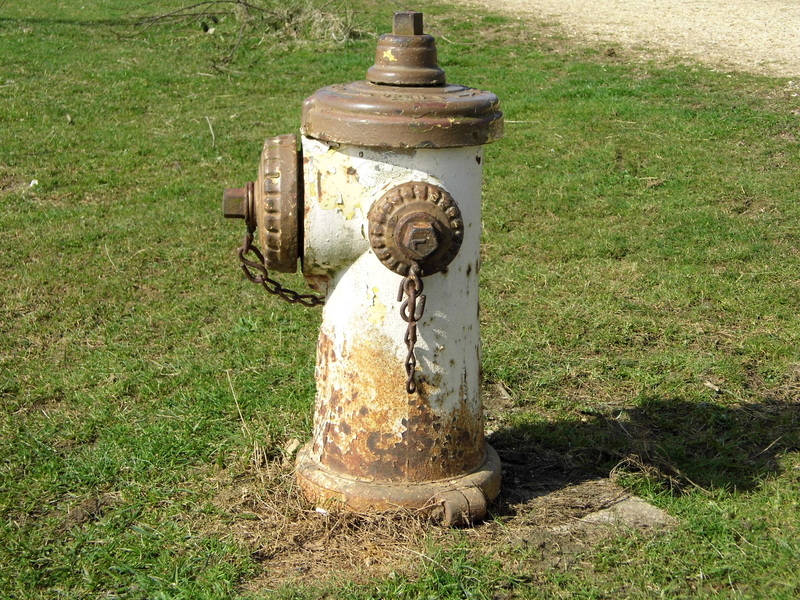 This went hand in hand with upgrading existing infrastructure to cope with advancing aerospace technology. RAF Gaydon was one of ten airfields selected to become V-bomber bases, and reconstruction began in 1953. 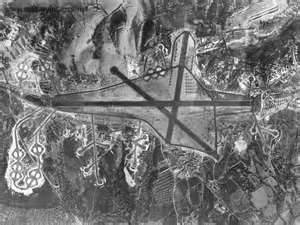 Interestingly, it was the only “temporary” wartime airfield chosen, and as such it required total redevelopment. 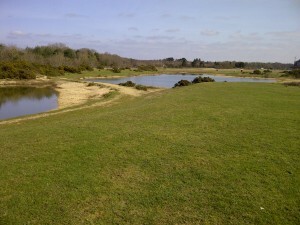 The old wartime airfield was completely flattened. 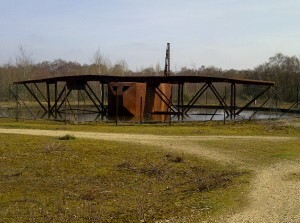 The base technical area was then built around the old wartime layout. 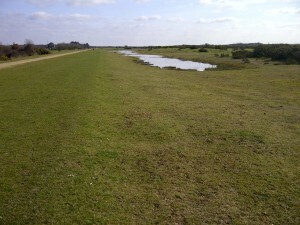 Instead of re-using the wartime runways, these were dug up and used as the hard-core base of an entirely new runway complex, built on newly-acquired farmland to the south-west. A mammoth 1.7 miles (or 3000 yards) long, accompanied by hardstandings, H-dispersals, taxiways, and fuel depots, this is still one of the longest runways in Britain. A new, glass topped control tower was built by the new runway. This tower’s design actually foreshadowed that of most major post-war control towers by having a fully-glazed visual control room, above the approach control room. As the wartime hangars were completely unsuitable, a new type of prefabricated steel structure was developed to house the aircraft: the type now known as a Gaydon hangar, which was then used on many subsequent airfields all over Britain. Two of these were built. The old wartime accommodation was not up to scratch for the first line of Britain’s defence, so an entire housing estate was built by the base to serve as married quarters. At its operational peak, the base employed over 2,500 people. RAF Gaydon became fully operational on 1st March 1954 under the control of No 3 Group Bomber Command, but it wasn’t until 1st January 1955 that it welcomed the first Vickers Valiants of 138 Squadron. This moved to RAF Wittering on 6th July 1955. 543 Squadron briefly visited for runway approach aid training, with photo reconnaissance versions of the Valiant and the English Electric Canberra T4, but they left for RAF Wyton on the 18th November 1955. On the 4th July 1955, 232 Operational Conversion Unit formed at Gaydon with Valiants; Handley-Page Victors joined them on 11th November 1957. Had nuclear war beckoned, RAF Gaydon would also have been one of Britain’s key dispersal airfields: as such, it would have gathered Victors and Valiants to be armed ready for sending off to Russia. It appears while Victors and Valiants were there, there were few fatal accidents. 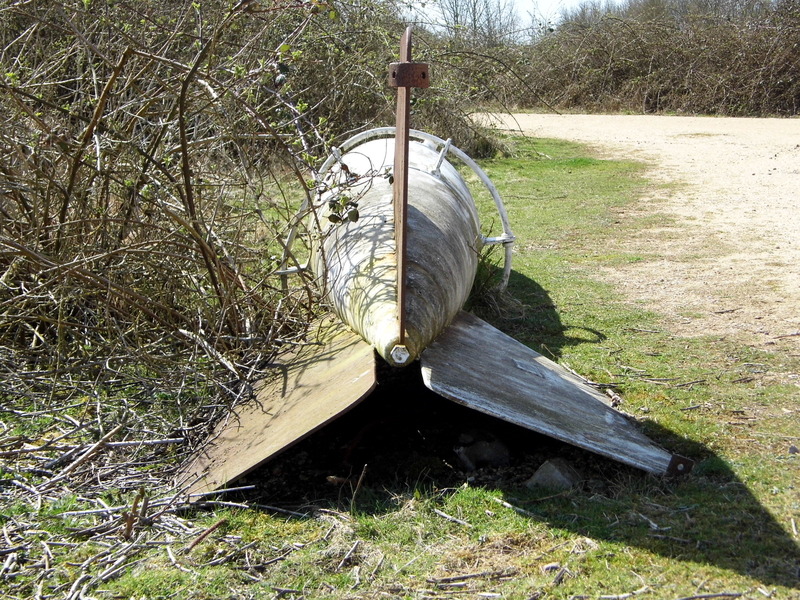 On the 2nd October 1962, Victor B1 XA934 crashed into Combrook Woods, a short distance from the end of the runway, after engine failure during take-off: only the co-pilot survived. During the late 1950s and 1960s, RAF Gaydon’s annual airshow was second only to Farnborough. 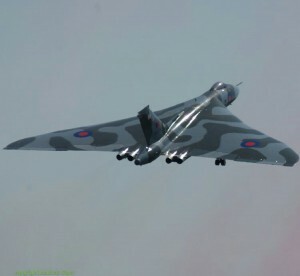 One of my colleagues, who has lived nearby all his life, told me of spending hours queueing on what was then the A41 (and is now the B4100) to get into the airshow, but watching Victors, Valiants and Vulcans, even Lightnings and Canberras, leaving trails in the sky and listening to them echoing off the landscape. 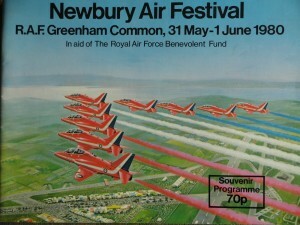 Gaydon even continued to host the RAFA Midland Air Day right up until 1975. 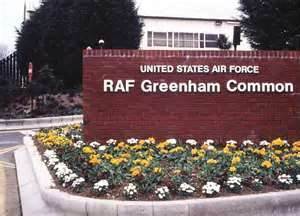 232 OCU disbanded in June 1965, and from September 1965, Gaydon housed the Varsities and Valettas of No 2 Air Navigation School, teaching basic navigation. 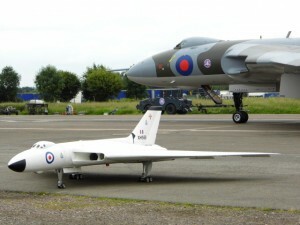 However, in May 1970, No 2 ANS moved to RAF Finningley (now, of course, Robin Hood Doncaster Sheffield, and the home of the only airworthy Avro Vulcan B2, XH558). Strike Command Special Avionics Unit of No 1 Group briefly stayed at Gaydon, but disbanded in December 1971. The station then went onto Care & Maintenance under the control of 71 MU Bicester Maintenance Command, until it was finally closed on the 31st October 1974. Interestingly, Gaydon was once considered as a potential site for a third London airport (presumably adhering to the budget airline definition of London), but this never happened. Instead, British Leyland bought the site in 1978, to turn it into a vehicle design and development centre. So, what’s left of all of this today? Most obviously, the runway and taxiways have been developed into the test track and vehicle proving ground. The runway was wide enough to serve both as the main straight of the test track and the brake straights (used for testing brakes, as you might have guessed). The rest of the runway, taxiways and dispersals have been turned into a series of differing road surface and technical areas for vehicle development and testing. 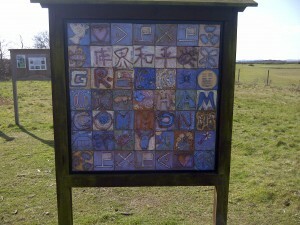 Fascinatingly, traces of Gaydon’s V-Force past can be seen around the proving ground. Many tie-down hooks are still there on various roads, firmly embedded in the concrete. Yellow lines along what were taxiways, showing the pilots where to go, are still clearly visible, hardly eroded by time. 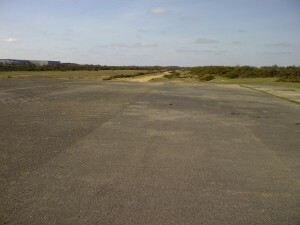 At the end of the brake and main straights, where there is now a vehicle disposal compound, you can see the filled-in squares of concrete which once housed the runway lights. 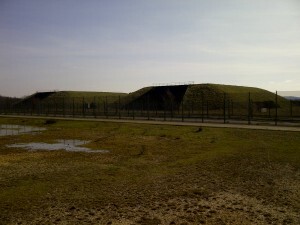 A huge embankment, shielded by trees, hides one of the airfield’s fuel storage tanks. The control tower is still there, though it’s now stripped of all ATC equipment: the lower floors are offices, and the glass-topped hexagonal visual control room is now a spectacular meeting room. In front, the station’s ‘GD’ designation is still kept scrupulously clean and painted bright white. I’d love to have taken pictures of all of these to show you, but one of the conditions of our test track / runway tour was no photographs. Understandable when you consider the variety of interesting prototype vehicles that were around! If you look at aerial photographs of Gaydon today, the site road layout still follows the old wartime A-runway pattern: the large building at the apex of the A is, in fact, Aston Martin’s facility. The original base gate house and entrance is now the Aston Martin entrance. Surprisingly clear on the aerial photos are the dispersals: the changing surface is noticeable on the ground, but far more obvious from above. Both the hangars survive, and are now used as vehicle workshops: one has had to be re-roofed, but it still retains its hangar footprint. The huge sliding doors have been replaced by much smaller roller shutters, though. What used to be the officer’s mess is now being used as the canteen and catering building. The atomic bomb store, some distance away from the main base area towards the village of Moreton Morrell, and surprisingly close to the Fosse Way, is now used as the British Film Institute archive. 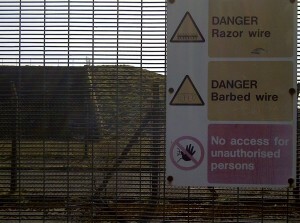 Despite there being many rumours (at least, when I was at Gaydon) about tunnels connecting the runway, the bomb store, and the hangars, there doesn’t appear to be any evidence to back that up. The other rumour, about an underground railway linking Gaydon to the nearby Kineton armoury depot, was also swiftly scotched by those leading the tour. The base accommodation was sold off as housing during the 1970s, and is now the village of Lighthorne Heath. 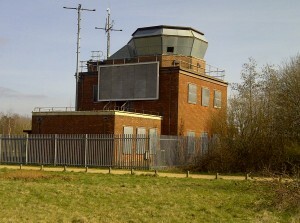 Other RAF-era buildings are still intact and in use on site, but as the buildings age, and development and expansion increases, these are becoming fewer. On the 11th November 2005, Jaguar Land Rover commemorated Gaydon’s RAF past with a memorial in the site gate house. (http://s37.photobucket.com/user/airfieldsman/media/VariousMemorials0029.jpg.html) It’s a simple, but fitting, tribute to those who served, and sometimes died, and to the past of a site that many simply don’t know. I could continue…………. and for a long time. Organisation commenced for Operation Cosford in early July with DM’s, emails, phone calls and WhatsApp messages to various folk culminating with the gathering at RAF Museum Cosford 23/11/2013. Many thanks to all of those who were able to help us celebrate, some of our followers were unable to attend but let me reassure you, you were with us in spirit. But that’s not the end, following on from the day I have been gathering thoughts and pictures from some of those who attended and you will find them all reproduced here in the order that I received them. Let’s just say to act as a momento for us, and an insight for others. 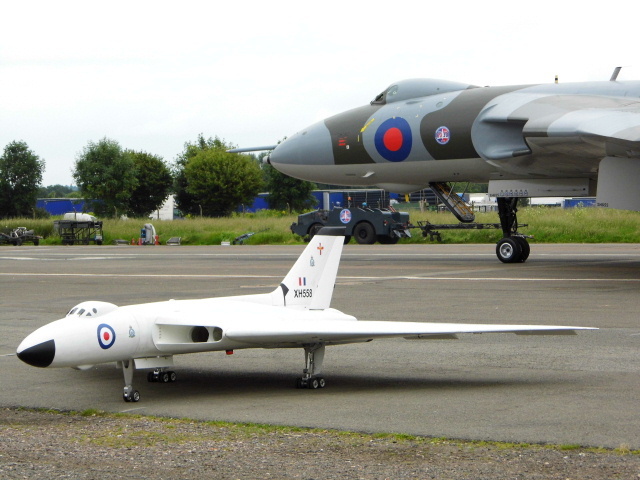 Until the next time ……………..
“It was really wonderful to meet and share with #twitterVforce at RAF Cosford, celebrating those who designed, built, fixed and flew the Mighty V’s. I learned far more from my friends in #twitterVforce in one short afternoon than I have in years of reading and studying. The V’s are metal, wire, plastic and paint but this was really a celebration of the fifth element, the human element that gave them flight. #twitterVforce plays an important part in supporting those that maintain not only the surviving V’s but their engineering legacy. Many young people are now involved in maintaining the aircraft and will embark on a career in aeronautical engineering as a result. Here’s to the future, not just of #twitterVforce but of the next generation of aeronautical engineers, designers and technicians”. 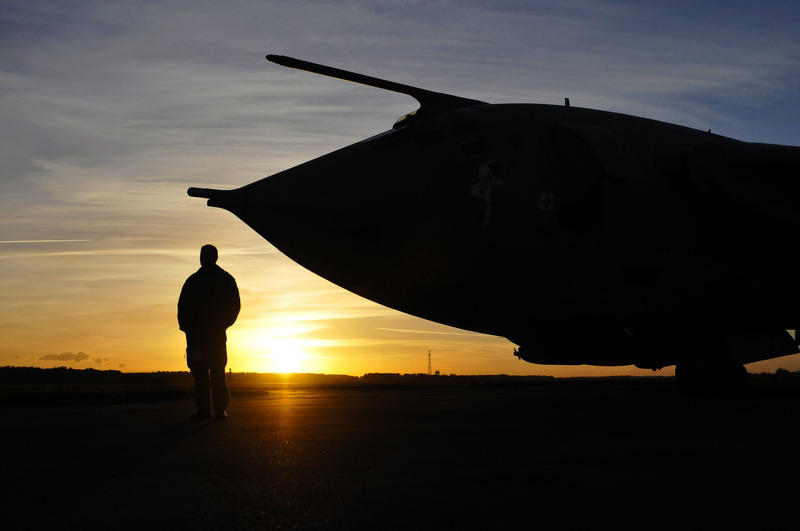 The 23rd of November 2013….the first anniversary of #twitterVforce coming into being to promote the British V Force and all things that fly. So, a meeting at RAF Museum Cosford, that’s all I know….apart from Rod and Mrs Rod I don’t really know who’s coming, then through twitter, that magic medium I start to get an idea …its all twitter friends who have an interest in aviation and all things V Force. So off I go, arriving at 10.00am just in time for coffee and a bacon cob while waiting for the others to arrive ….while in the café I meet @TD4XXIIII otherwise know as Vicky (she gets to play with Vulcan XM598). More geeky chats. Soon people start arriving , AvroVulcan617, who’s know as Andy in real life, Siobhan and Graham, Andy No 2 and April all appear together. Soon everyone’s chatting away and very soon Dave Taylor and AvGeekette, his better half, arrive along with Lindsay and her partner. Soon everyone’s getting on like a house on fire, avgeeks having a happy time in a museum full of aircraft …more tongues hanging out than a boxful of puppies….anyway soon after up comes the man himself Rod and Mrs Rod, the creator along with Dave and AvGeekette of #twitterVforce. So the scene is set and off we go a wandering, this band of happy geeks. Hanger 3 for TSR2 and AvroVulcan Andy’s tongue hits the floor and just about stays there, like the rest of us its like kids in a sweet shop……Rods not happy …someone’s pinched the Avro 707 oh dear! !..and put an EAP in its place this is what became the Typhoon. Well, whilst wandering around there John Wood and Bob Miller appear, co-authors of Avro Vulcan Diamond Jubilee the day is complete? We think. Well after a wander over to the Cold War hanger and more sights like three V bombers together, the only place in the world where there is. It’s time for a well deserved coffee where we get chatting and those that haven’t been to Cosford before wander off to get photos and look around. Then surprise of the day !! Matthew Ward the History Guy arrived and that was it …day complete. after a day of planeporn and great conversation the day was over far too quickly, we got some of us into a group shot but more were missing ….but what a day !! We went home a happy band of avgeeks and we enjoyed the first Birthday of #twitterVforce. Here’s to the next one, and if I’ve missed anyone or got your names wrong ..sorry”. Driving up to Cosford for the #twitterVforce meet, I wasn’t sure what to expect. Apart from meeting Rod again, spending time gazing wistfully at TSR2 (I may need therapy for my TSR2 fixation), and of course taking in the rest of the museum, the thought of meeting lots of people off the internet suddenly seemed strange. I needn’t have worried. Turns out a bunch of #avgeeks who all share a love of planes and the V-Force can find plenty to talk about, even in a freezing cold car park! Plus, of course, being up close to the Vulcan, Victor and Valiant trio and wandering round Cosford’s excellent Cold War exhibition meant that the plot bunnies were given lots of food for my planned Cold War novel … which, of course, features Vulcans. The downside of being an #avgeek is my plot is getting technically complicated, so if anyone can give me a crash course on mid-1960s Vulcan ECM systems, that would be brilliant! On the 23rd of November 2013 I had the pleasure of spending the day at Cosford RAF Museum with the #twitterVforce family, I’ve got to admit the journey down was an experience and such a laugh (you know who you are) but after arriving and finally getting to put faces to names, we ventured out into the museum of which I have to admit this is my third time here, and I never get bored of looking around. My best surprise of the day was the Eurofighter prototype, I had no idea they had this beast and was really blown away by how different it looked to the Eurofighter we have now, there’s just something about it that makes it look like a different aircraft. Something else I was looking forward to was having a look at the Dornier 17 wreckage that was raised from the The Goodwin Sands, now I have mixed feelings with this as after seeing what is left, I have no idea how this can be put back together, but at the same time it’s great that this is the last sample of this particular aircraft. The day panned out brilliantly and as usual when I made it into the Cold War Hangar you can’t help but realise how awesome this collection is, not to mention the last sample of Vickers Valiant XD818 which is the actual craft used to drop the first hydrogen bomb made by Britain on Christmas Island. As usual you can’t help but just stand there and gaze, I mean they have a Vulcan, Victor, Valiant, Lightning and Canberra, need I say more. On that note I just want to say a big thank you to @ROD558 @DaveVForce and @AvGeekette for arranging this fantastic day and we should definitely do it again soon. I was excited about my first visit to Cosford for the V force meet up. Mr AvroVulcan617 picked us up early and we headed off for an entertaining road trip with Siobhan, Andy & Graham. On arrival, we all met in the refuel cafe and it was great to put ‘twitter ‘names to faces and to look at Robert Miller & John Wood’s informative book ‘Celebrating 60 Glorious years of the Vulcan’ . We also heard about Lindsey’s talent for making beautiful aircraft shaped cakes including some lovely vulcan biscuits. I was particularly looking forward to seeing the Vickers Valiant B1 in the Cold War hanger as I had not seen one before and I wasn’t disappointed as the Handley Page Victor K2 and Avro Vulcan XM598 were nearby completing my three favourites. 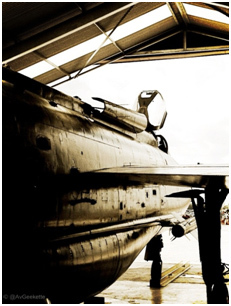 The Electric Lightning XG337 is suspended up right from the ceiling making for excellent photo opportunities too. Being a Kentish girl I was pleased to finally get to see the Dornier 17 which was rescued from the seabed off the Kent coast in June this year. The museum team are doing a great job of cleaning and restoring her. After many cups of tea, mince pies and trying not to buy too much in the amazing shop it was time to head back. We made our way out to the car park and said our farewells. The day was a great success and it was good to see after the positive feedback and sharing of wonderful photos on the twitter feed. Thanks for organising Rod and I’m looking forward to the next meet up! It only seems like five minutes since I was stood on the dispersal pan with Rod, beneath the delta wings of Vulcan XM655 talking about ideas for #tVf & only a few minutes since pouring over web code to bring it all to life! Well at the time it seemed like ages away but then suddenly before no time at all we were in the car off to pick up an excited Rod & Sally from the railway station, off on another #twitterVforce road trip! – Operation Cosford was on! So, then we headed off to RAF Cosford, as always the M6 was a pleasure! 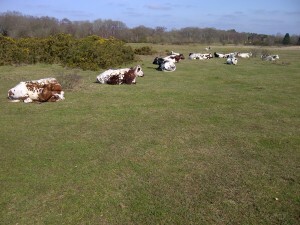 But we were all kept very entertained and amused along the way, we do love our get togethers and road trips! We arrived at the museum, I think we were last there as it happens! A few familiar faces greeted us, plus some introductions of peeps only known to us by their twitter usernames, yet their reputations proceeded them! In a good way though! – These were some of the many people who have very happily adopted the #twitterVforce doodah and on this particular day brought a group of people together with a common interest. I was chuffed, along with Rod, that if the concept had acheived something, it was gaining some great new friends and fellow enthusiasts along the way! Would just like to add along those lines, if you’re at an airshow and you see one of us with a #twitterVforce t-shirt on, pop over and say hi, we won’t bite! So off we went around Cosford, making slow progress around the exhibits, which was great! – So many stories and snippets of information, we all had a really good time! We must have been sat in the Cold War hangar cafe for a couple of hours talking, plus gazing up at the Vulcan & Victor, with the Valiant just out of sight further into the hangar. Eventually after many hours we realised they did actually want to close the museum for the evening! We made our way to the car park for some more lengthy discussions! After those and even throwing some ideas in for the next #twitterVforce meetup location and event, we all agreed on the next one, but we’re not letting on just yet folks! Thank you to all those who joined us, a fantastic venue and superb company, we look forward to the next one! Cheers!! #twitterVforce are very proud to announce that we have teamed up with Andre Tempest & Team Victor to celebrate the anniversary of the arrival of Handley Page Victor B(K).Mk2 XL231 ‘Lusty Lindy’ at Elvington 20 years ago on 25th November, and to offer you the once in a lifetime opportunity to own a piece of this historic V Bomber and veteran of Operation Granby during the first Gulf War. A full photo shoot of the days proceeding will also go towards an exclusive blog to be published both on Lindy’s blogsite & the #twitterVforce website. *other delivery/collection arrangements can be organised if required. Winner will be contacted by #twitterVforce – Please ensure your email address is correct!!! Payment can be made either via the donate button at (VictorXL231.blogspot.co.uk) or in person at Elvington via Andre Tempest if collecting. You can bid as many times as you like! So there you go………….you may already own a piece of a Vulcan or a rare piece of a Vickers Valiant – so now is the time to complement your collection with a historical piece of British engineering…….. then again, maybe what a fantastic way to start your collection and in doing so, helping a V Force Bomber and her team of dedicated volunteers preserve this icon for future generations to gaze in awe at her finesse, power and damn right beauty. To the top right of this blog post (& below the @VForceHQ twitterfeed on the main page) you will find our Lusty Lindy auction! The sun was shining, the birds were singing and the ominous looking black clouds overhead were not dropping their cargo all over Bruntingthorpe. All was right with the world. As we merrily bowled along the country roads of South Leicestershire, I quietly reflected on the treats in store for the day. At least, I tried to quietly reflect. My husband on the other hand was waging a one man war on the left hand suspension of my long suffering car. Excitedly explaining the details of what we were to see that day, I do believe he would have left a cranium shaped dent in the car roof, had he not been strapped in. His bouncing has only ever been eclipsed by that of our illustrious leader @ROD558 on our journey to RAF Cosford. Now. To give a bit of background. Some months ago, m’lovely husband informed me that the Lightning Preservation Group, based at Bruntingthorpe airfield would be staging their yearly QRA. This year, however, would be special as not one, but TWO Lightnings would be pounding down the runway. ‘Book our tickets now!’ I cried. ‘Have you booked them yet?’ I enquired five minutes later. Tickets secured, I then settled down to a mere three month wait for the day. So! Back to the shining sun and wittering birds etc…having parked up, my attention was immediately drawn to the ice cream van parked next to the stalls selling all manner of aviation paraphernalia (the stalls, not the ice cream van…although, I think someone is missing a trick somewhere here…Vulcan ice lollies anyone?). Having extracted a promise that ice cream would be forthcoming AFTER I had satisfactorily shown willing to eat the whole of my lunch, I then became further distracted by many many shiny things. O so many shiny things. I love visiting Bruntingthorpe and consider myself a very lucky girl that I live within reasonably easy reach of such a fantastic place. Looking around I found I was, once again, spoilt for choice. Where to go first? The tail fin and folded wing of a Buccaneer could be seen in the distance, with ‘Teasin Tina’ not far away. 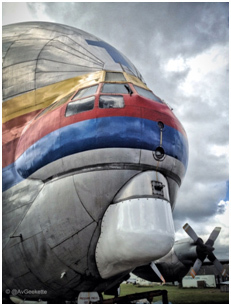 The Super Guppy dominated the skyline – a giant of a plane. 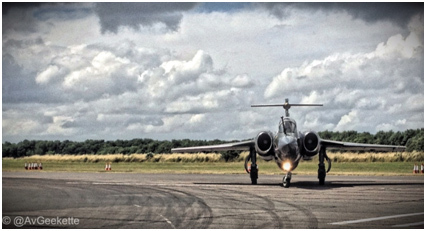 Off to the left, I spied a Gloster Meteor….choices choices! 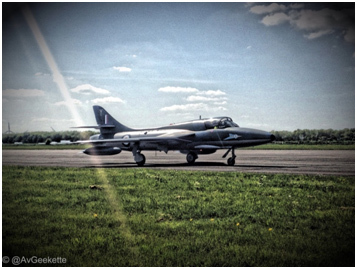 As I looked back, I realised an easy decision had been made for me however, when I found m’lovely husband disappearing in the direction of the Lightning’s QRA shed, leaving me stood gawping in a not overly attractive manner at the many aviation stars around me. During the late 1980’s, the Lightnings were reaching the end of their operational careers. As with so many of our iconic aircraft, their future was uncertain. Assuredly, some would end their days at various museums up and down the country. But what of working examples? Would there be any? Would the Lightnings forever be silenced and remain as stark, static reminders of how closely our country was protected by these amazing machines? Luckily for us, the Lightning Preservation Group were on hand to put in a bid, win and take delivery of XR728 from RAF Binbrook in 1988. Five years later, in 1993, XS904 arrived to take up residence at Bruntingthorpe – a home kindly given to the Lightnings and many other jets by the Walton family. In 1994, a QRA shed was purchased to give the Lightnings a more permanent shelter from the rather unreliable South Leicestershire weather. 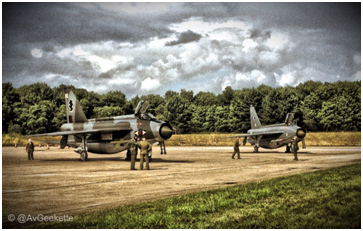 So in a way, the Cold War Lightning exhibit at Bruntingthorpe is complete…a fitting memorial to a beautiful aircraft. And they continue to survive in such amazing condition thanks to the Lightning Preservation Group whose ambitions have mostly been realised on this day. So, when a group of people have gone way above and beyond to save and maintain two such beautiful aircraft for the nation, they deserve to have avgeekophiles like myself gaze in glazed admiration! Several photos later and me being me, I noticed the wee display/shop/office sat next to the hangar and so wandered off to have a nosey…one mug, two badges, one keyring, a print and a quick chat with the very nice man manning the merchandise later, I decided it was a good idea to gather up m’lovely husband and go and have a wander round the static displays. At around one o’clock, more people began drifting towards the netting thoughtfully provided to stop too many people falling under the wheels of fast moving jets. The doors of the QRA shed were now tightly closed in anticipation of the recreation. The tannoy belted out commentary advising people to move towards the barriers and keep watch…didn’t need to tell me twice! Some background information given over the tannoy, the build up of radio alerts. Ground crew and air crew alike came pouring out of the wee shed I mentioned earlier…heavy doors where pulled aside, air crew climbed into their seats and WHOOSH!!! the engines were started. Foliage and trees waved wildly behind the Lightings, the all clear was given and one started to move out of the shed and onto the taxiway…off she moved, past the crowd and up towards the runway. The sun glinted off the gorgeously shiny bodywork, the insignia and badges catching the light. Have you ever ‘felt’ a noise. Like a vibration that your body picks up through your feet and booms in your chest, taking your breath away for a brief moment? That’s the same feeling you get when a Lightning screams past you on a runway at full pelt! And to top it off, on this day we got it twice! So beautiful! 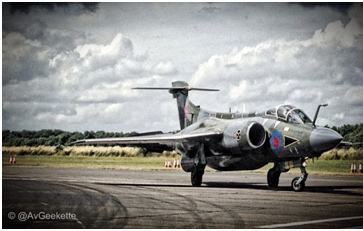 The Blackburn Buccaneer. And yes, I did get an ice cream. With a flake. 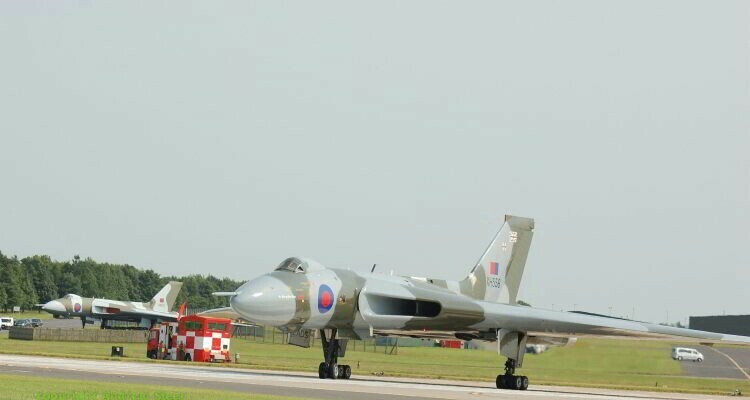 Sunday 25th September 2013 will go down as an historical moment for Myself, Dave T, AvGeekette and all of our many many dedicated followers of #twitterVforce. We also have the pleasure of passionate people like ourselves who do not ‘do’ Social Media that keep up to date with our aims, goals and achievements via our website alone whom may not have seen the events of the day. 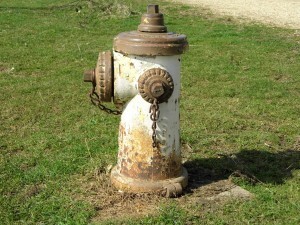 This blog acts to serve as a little momento. It was the final sortie of a very busy 3 day flying/displaying weekend for Avro Vulcan B.Mk2 XH558 with displays at Dunsfold, CarFest South and Little Gransden. Tweets and pictures were coming into #VForceHQ at a rapid pace by followers lucky enough to be under her chosen route for the day. 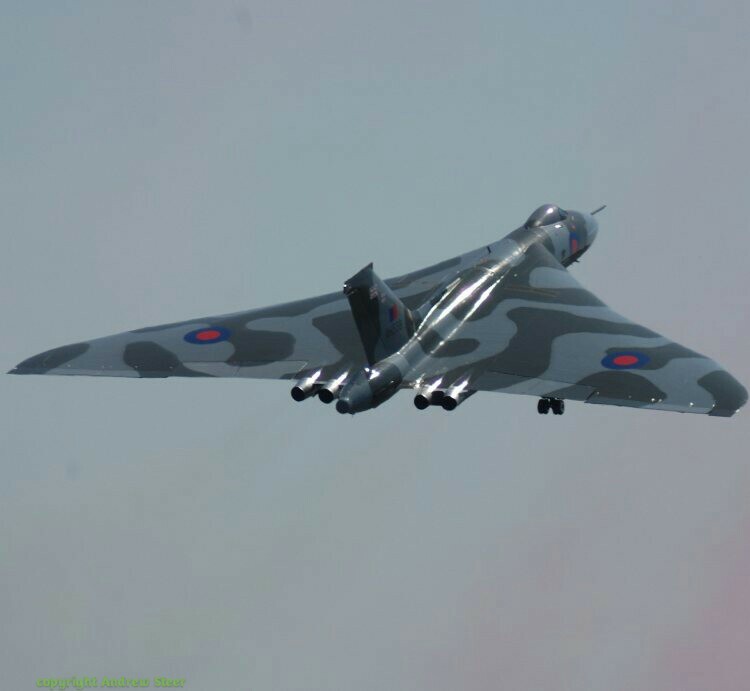 Following on from her final display at Little Gransden, tweets from the official Vulcan XH558 ‘live’ twitter feed – @XH558 – for her homeward bound journey commenced and then something very special occurred. The next tweet was something a bit different. 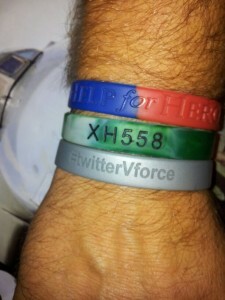 Hello to everyone following on Twitter who watch the #twitterVforce Thanks for all your support in spreading the word. In the run up to Waddington 2013 there were three aircraft in particular I was looking forward to seeing, the Vulcan and Viggen in the flying display and the VC10 in the static display, in addition I was looking forward to seeing all three on the arrival days. Arriving at Waddington for the first arrival day on the Thursday I had no idea what was going to be turning up when, I had expected the Vulcan to be coming on the Thursday but an e-mail earlier in the week had confirmed this was arriving on Friday. 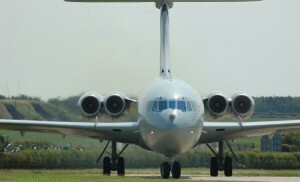 After speaking to a couple of people who were there I turned out the VC10 and Viggen were also due on the Friday. Friday was an early start with me arriving at Waddington about 8am and a large arrivals plan showed the VC10 due around 10, the Viggen due about 13:30 and the Vulcan at around 15:30. 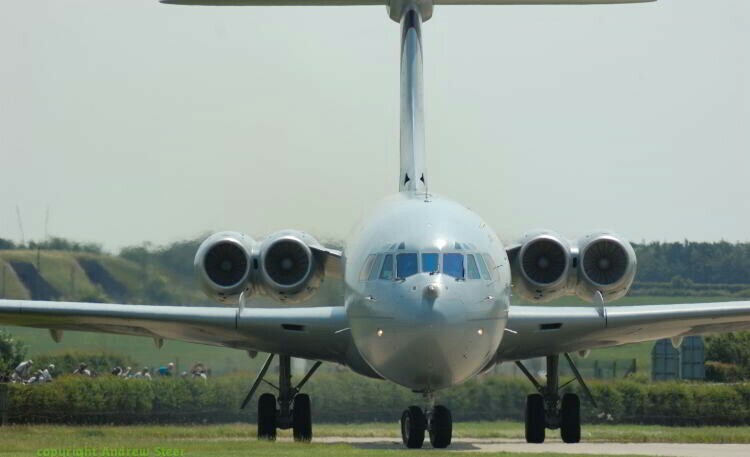 The VC10 turned up and landed without doing any circuits which was a shame as it was one of the last times I’m going to see one flying, still even just seeing it come in and land was nice and the noise from the Four RR Conway engines takes some beating. On then to the Viggen arrival after hearing the pilot say he was not doing a circuit it was a case of grab the camera and get some photos of it landing, I had hoped it would go round at least once so I could watch it go around then take photos of the landing but never mind. I had found a decent spot for the landing and was happy enough with the fact I had got a couple of decent shots. I had been keeping track of the Vulcan in the run up to its arrival on the official @xh558 twitter feed and after taking off from its base at Doncaster 558 did a practice over RAF Scampton before making the short flight over to Waddington. Knowing Kev Rumens was flying on the Friday I was hoping we might get a noisy missed approach and a decent wingover before landing and we were not disappointed. After landing the Vulcan turned round and came back up the runway rather than the taxiway and parked up in front of the park and view area ready for the weekend. Arriving on Saturday early allowed me to get a few photos of the Vulcan parked up without to many people getting in the photos before moving on to get a few photos of the VC10 in the static area. Ground tours of the Vulcan and the chance to look inside the VC10 both seemed to be attracting a lot of people and hopefully in the Vulcan’s case a lot of donations. While the Gnats display team were displaying the Vulcan was moved away from the Vulcan Village onto the live side of the airfield as the crew began there preflight checks and start up. As the Vulcan was displaying after the Red Arrows rumors were going around about a Reds and Vulcan fly past, as it happened the Reds did a flypast with a Sential R1. 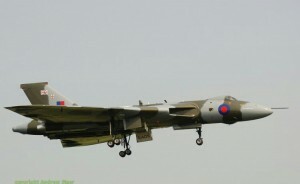 The Vulcan on Saturday was flown by Bill Ramsey with Martin Withers as co-pilot. As the Vulcan made its usual noisy take off and climb out red smoke from the final Red Arrows flypast was still lingering in the sky and this made for a somewhat different photo opportunity. Bill’s display consists of a number of passes, including several with bomb doors open most of which were followed by climbs into fairly aggressive wingovers. The display ended with a missed approach followed by a climb into a wingover before landing as usual the nose being kept up after landing giving a good demonstration of the aero dynamic braking personally I would have liked to have seen the brake parachute deployed but Waddington’s long runway means there is no need for that. This was the first time I had seen Bill Ramsey display the Vulcan in the past I have seen Martin Withers , David Thomas and Kev Rumens all fly the display and each pilot seems to bring something different to the display which helps to keep things interesting. After the Vulcans display it was again parked up close to the Vulcan Village and ground tours began again later in the afternoon. A few hours later the Viggen and the rest of the Swedish historic flight were due to display and the SK60 displayed and landed with no sign of the Viggen or the J29 – after the SK60 landed I overheard someone saying the Viggen and J29 had both gone tech and would not be displaying. By this team the Dutch F-16 was displaying and when this was followed by the Check air force L159 it seemed we would not be seeing the Viggen. 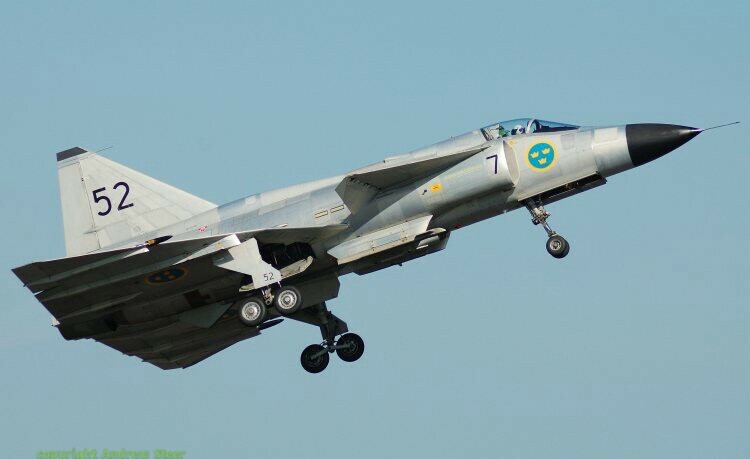 However half way through the L159 display the Viggen taxied out towards the runway and at this point I wondered if we were just going to get a taxi run like we did in 2008 when the Vulcan went tech on the Sunday. But no the commentator said it was going to fly so at this point I made a mad run to the front of the crowd line and got there in time to get some photos of the take off and display – for a single enginged fighter the Viggen is certainly noisy and the pilot really chucked it around althought not as much as some of the older Viggen displays I’ve seen on youtube. The landing was certainly showed of the types STOL ability stopping after using hardly and runway before taxing and letting the J29 display. 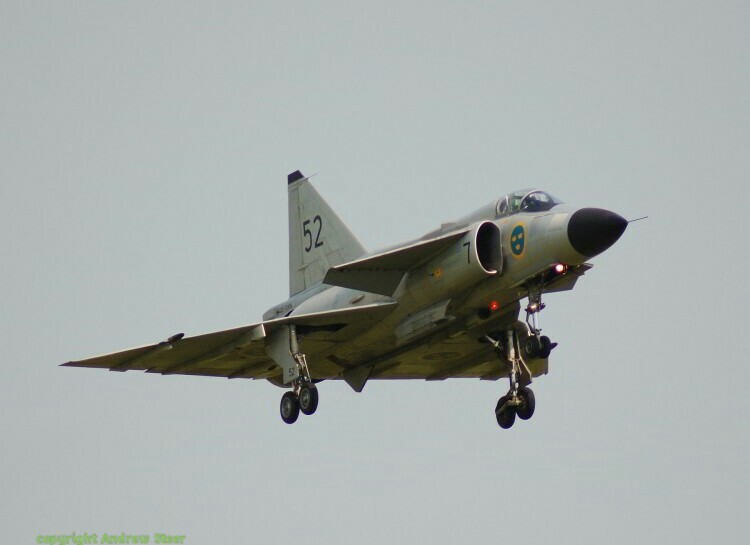 So over 2 days I had finally got to photo the Viggen display finally seen it fly seen the VC10 for one of the last times and seen the Vulcan once again a good couple of days and I can’t wait to see the Viggen again later in the year.